Scheduled Appearances: Attending the Boston Author Event March 16th – click here for more info. I grew up knowing I wanted to be a writer. I’m very close to my family and friends and I love being around them. I also enjoy talking with and being around other writers because writing can be isolating. 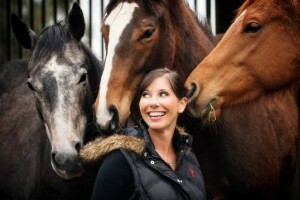 The other passion in my life are my horses. They nourish the soul and in many ways keep me sane. It’s a busy life. I have three kids, write full time, manage the house and sprinkle in a few more responsibilities in there and some sanity (or equine therapy) is needed. I write books that I hope make people laugh a little, escape from the stress of day to day life and hopefully they feel a connection to my characters.Something kind of funny and ironic about me is that I don’t know how to type. I hunt and peck, so my first drafts have tons of mistakes. I really wish I’d taken typing in school.I love to cook, but hate to clean–but love a clean house, so every Saturday I spend my day cleaning house. I’m a creative cook and can never create the same recipe twice and this makes it hard for me to get down the recipes in The Wine Lover’s Mysteries just so. Michele also writes thrillers under the pen name A.K. Alexander and Sofia Cruz. (I will add those pages in the future). In this short, two of your favorite characters get to take center stage–Simon Malveaux and Nikki and Derek’s beloved Rhodesian Ridgeback Ollie.